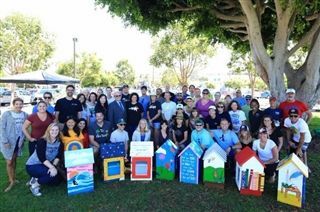 Last week, as part of a joint project with the City of Carlsbad, Pacific Ridge faculty and staff designed and stocked eight "Little Free Libraries" to promote education and community throughout the Carlsbad Barrio and beyond. In between painting and sorting through books (faculty and staff donated more than 700 books that will cycle in and out of the libraries!) the group learned about Barrio history from Lola's Market and Barrio Museum owner Ofie Escobedo. Volunteer Coordinator for Carlsbad Neighborhood Services Marie Jones-Kirk spent the afternoon on-site to show support, and even Carlsbad Mayor Matt Hall stopped by with encouragement. The libraries are currently being weather-proofed and are on track to be installed later this fall.